WASHINGTON, Aug 14 2013 (IPS) - Work by the Group of 4 (G4) union of Haitian peasant organisations, along with assistance from the Dessalines Brigade – South American peasant leaders and agroecology experts supported by La Via Campesina – has been singled out for promoting “good farming practices and advocat[ing] for peasant farmers” in Haiti. The two network organisations, it was announced Tuesday, will be awarded the 2013 Food Sovereignty Prize, an annual award given to groups that promote a more democratic, community-based food system. The G4 alliance represents over a quarter-million Haitians. Its relationship with the South American peasant leadership is intended “to rebuild Haiti’s environment, promote wealth and end poverty” in that country, which continues to feel the devastating effects of the major earthquake that struck the island in 2010. “We wanted to honour that relationship,” Charity Hicks, of the Detroit Food Justice Task Force, one of the groups behind the Food Sovereignty Prize, told IPS, referring to the partnership between G4 and Via Campesina. Hicks’ organisation is just one member of the U.S. Food Sovereignty Alliance (USFSA), the group offering the award. USFSA aims to “end poverty, rebuild local food economies, and assert democratic control over the food system”, as well as to connect “local and national struggles to the international movement for food sovereignty”. 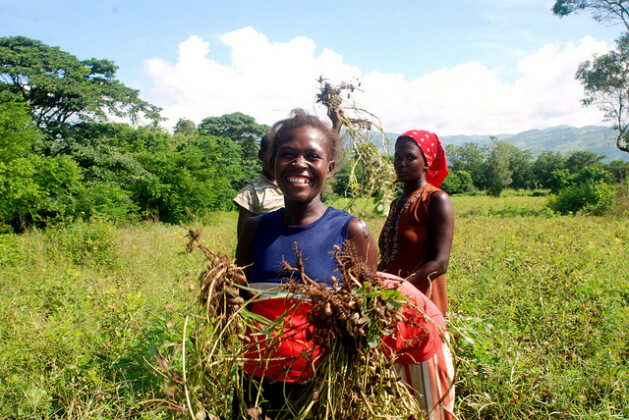 Hicks lauds the partnership between the Haitian peasant union and the South American groups as an example of food sovereignty organisations from different regions “sharing knowledge and skills, respecting ecologies and creating food democracy”. In addition, the G4 union stood out for a decision made in 2010 by one of its member groups, the Peasant Movement of Papaye, to reject a substantial donation of hybrid seeds by U.S. mega-producer Monsanto following the earthquake. “Denying the [Monsanto] seeds represented significant opposition to what the corporate food system is doing by trying to control our food,” Lisa Griffith, of the National Family Farm Coalition, another member group of the USFSA, told IPS. The opposition to Monsanto was especially important in the decision to award G4, Griffith says, because the Food Sovereignty Prize acts as an alternative to the World Food Prize. That annual award was given this year to, among others, Robert Fraley, a high-ranking Monsanto executive. According to Hicks, however, there is reason to question the merits of the prize. “The World Food Prize represents a way for corporations to give themselves awards for the notion of using technology in order to feed the world,” she says. Indeed, one of the many corporate sponsors behind the prize is Monsanto itself. On the other hand, food sovereignty groups, according to Griffith, offer an important alternative to the corporate producers because they have “a much stronger understanding of what their communities want to produce and want to eat. “These communities don’t need to be taken over by corporations who profess to know better about what [the communities] want,” Griffith says. Along with the announcement of the G4 as the winner of this year’s award, the prize also lauded the work of three additional nominees for their work in promoting the values of food sovereignty. The Basque Country Peasants’ Solidarity (EHNE), which was one of the groups responsible for the founding of Via Campesina, represents 6,000 members in the Basque region. It received mention for, among other things, its work with young farmers. The National Coordination of Peasant Organisations of Mali, with around 2.5 million members, was also recognised for its advocacy work in support of democratic agricultural policies. In part due to its efforts, Hicks says Mali is now one of the first countries to have enshrined food sovereignty in its national constitution. Finally, the Tamil Nadu Women’s Collective (TNWC) stood out for its work empowering women in the South Indian state. “Through the [TNWC], 100,000 marginalised women are organised, many in unofficial worker unions or small collective farms, to strengthen their food sovereignty and thus their broader power,” the USFSA noted in a statement. Following on Tuesday’s announcements, a formal awarding ceremony for the Food Sovereignty Prize will be held on October 15 at the Smithsonian Institute’s Museum of the American Indian, in New York City. Representatives of each of the four groups will be flown in and will accept modest monetary gifts on behalf of their organisations. The venue, Hicks says, was chosen for symbolic reasons, in order to “honour indigenous communities worldwide”.